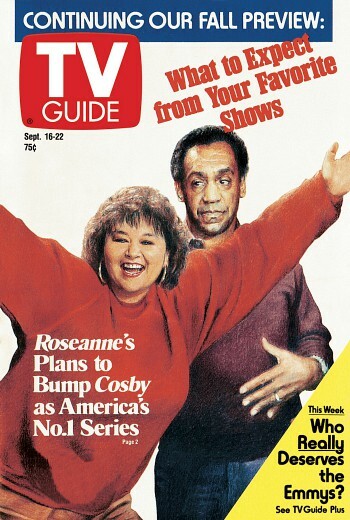 This 1989 TV Guide magazine cover has gone viral on social media following ABC axing Roseanne yesterday. Both were adored as either American’s “TV mom” or “TV dad” at the height of their success. But in 2018 their episodes have been pulled and the news is for all the wrong reasons…..
Look what happened to the saccharine ‘7th Heaven’ a few years back-there’s precedence for all this. I’m concerned where Cosby’s hand is heading! Both are owned by The Carsey-Werner (Television/Distribution) Company. I looked at there website a few weeks ago, it still has them listed. I think the big question is how many shows will get the axe both in initial run and reruns if a cast member does or says something unacceptable? Hopefully TEN can replace Roseanne with 3rd Rock from the Sun.